How Long does PayPal to Paypal Transfer Take? The PayPal is one of the major payment processors in the world. With the Million of dollars of transactions every day, the PayPal has captured the majority of the payment processing market. There are millions of sites and hundreds of countries accepting the PayPal as their payment processor. The company offers several types of accounts for their users ranging from the Personal to Enterprise level. Every kind of account carries different limitations and set of features, which is very interesting. The Paypal not just supports the third-party payment transactions, but also have its wallet. The users can make use of wallet and load funds in their account for cardless transactions. The users can transact on the third-party e-commerce sites or even send the funds to other PayPal users. Due to this flexibility, the PayPal has become one of the best payment processors in the world. So, you’ve received a payment from your client upon completion of the project, and you want to get that money in the bank. But it’s still not there, and you want to know how long does a PayPal transfer take? How does PayPal Funds Transfer Works? How Long Does a PayPal Transfer Take? The PayPal offers three types of fund transfer for all of their users. The first one is the PayPal to PayPal transfer, second is the Third-party payments, and the third is the Wire Transfer of funds to the user’s bank account. All three are very useful, but they bear different processing time. In the PayPal to PayPal transfer, users can transfer money to other PayPal user in no time. The receiver has the option to spend the received money or get it back in the bank account. In the PayPal to Third-Party website, the users can pay their bills or invoices and buy products. The PayPal works as the mediator between you and the site to deduct and transfer the money to the beneficiaries. In the third method, i.e., in Bank Transfer or Wire Transfer method, the users can get their PayPal wallet money in the bank accounts. Unlike the other ways, this is something traditional and comes with additional charges and is a time-consuming method. As the PayPal is a payment processor, it will take a few moments or minutes or even hours to process the payment. If you are facing some delays in sending or receiving the payments, then this post is for you. in this post, you’ll know everything about the PayPal payment transfer time and also know how long does a Paypal transfer take for every payment processing method. The PayPal to PayPal fund transfer is trusted by many users. Most of the companies send their affiliate payments and commissions to their affiliates via the PayPal. If you receive a Payment from another PayPal user in your account, then it’s a PayPal to PayPal transfer. The PayPal to PayPal transfer takes almost no time as it’s immediate transfer. Although, it may take some time if the payment is put on hold due to internal issues or the issues with the Credit card of the sender. The PayPal is a popular payment method used by most of the famous e-commerce websites. When you pay money to the online retailers or any website selling services, it is known as the PayPal to Merchant payment. If you are interested in known how long does a PayPal transfer takes in case of Paypal to Merchant transaction? Then it’s instant. All you have to do is to choose the PayPal as payment method while checking out and the transaction is done. The transaction will complete within a fraction of second. Amongst all of the PayPal Transfers, the PayPal to Bank account is the slowest. Most of the countries, the process of transferring the money from your PayPal account to your Bank or Checking account takes anywhere between 3-5 Days. As the banking system is every country is different, the company has to follow the strict guidelines set by the Apex Banking institution. That’s why the PayPal to Bank account Transfer takes approximately 3-5 Days. If you’ve not completed some procedures, then you should expect your payment in the bank account after completing the mandatory procedures required by the Apex Banking Institution of your country. 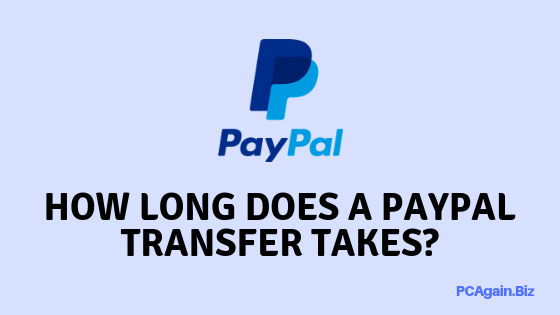 So, this is the answer to one of the most common query, How long Does a Paypal Transfer Take. If you are waiting for your payment from the client or waiting for the confirmation of purchase invoice, this answers will help you to decide your next steps. I hope this post clears your all doubt and you have the clear idea on how much time does PayPal takes to transfer your money from one account to another account.